Looking for our tours in or around Kathmandu Durbar Square? Kathmandu’s Durbar Square was where the city’s kings were once crowned and legitimised, and from where they ruled (‘durbar’ means palace). As such, the square remains the traditional heart of the old town and Kathmandu’s most spectacular legacy of traditional architecture. It’s easy to spend hours wandering around the square and watching the world go by from the terraced platforms of the towering Maju Deval; it’s a wonderful way to get a feel for the city. Although most of the square dates from the 17th and 18th centuries (many of the original buildings are much older), a great deal of rebuilding happened after the great earthquake of 1934. The entire square was designated a Unesco World Heritage Site in 1979. The Durbar Sq area is actually made up of three loosely linked squares. To the south is the open Basantapur Sq area, a former royal elephant stables that now houses souvenir stalls and off which runs Freak St. The main Durbar Sq area, with its popular watch-the-world-go-by temples, is to the west. 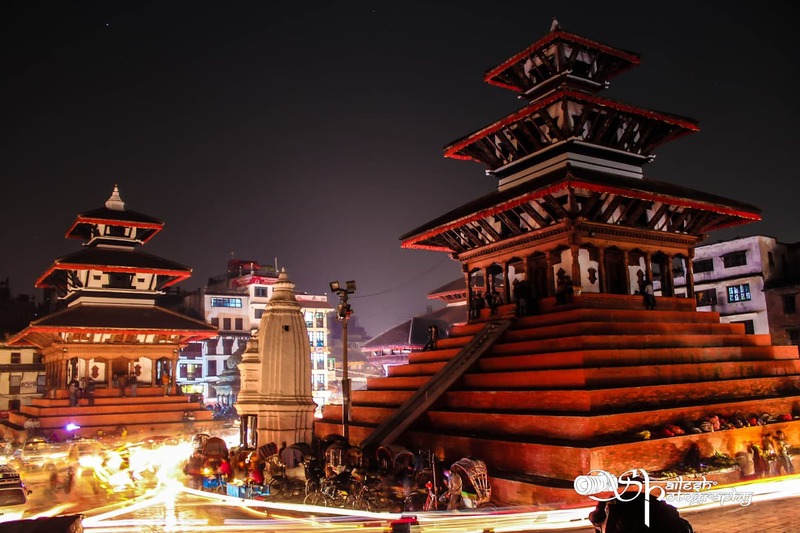 Running northeast is a second part of Durbar Sq, which contains the entrance to the Hanuman Dhoka and an assortment of temples. From this open area Makhan Tole, at one time the main road in Kathmandu and still the most interesting street to walk down, continues northeast. A good place to start an exploration of the square is with what may well be the oldest building in the valley, the unprepossessing Kasthamandap.